Mount Pleasant Granary - Thursday 11th. December, 2014 – We stop work to prepare for Christmas! Woke and walked Mix in the snow before driving to Pearsons with Rachel to collect two new gas bottles to ensure that her team are warm for the kilt-making class tomorrow. Fitted up the gas bottles and then Tom arrived. Neil was not with him today because with the bad weather he has decided to make an early retreat home to Yorkshire which, in the circumstances, seems very sensible. I am grateful for all that he has done to help us and I enjoyed meeting up with him again. 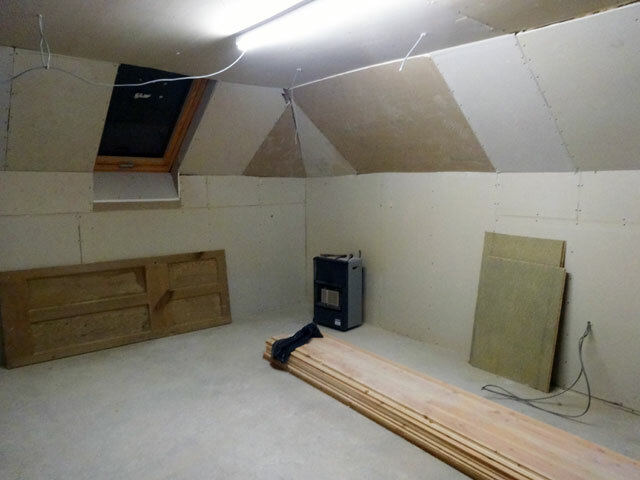 Tom and I completed the ‘studio’ plaster-boarding and cleaned up the room so that we can abandon it for Christmas. Then we enjoyed a lengthy coffee and watched England defeat Sri Lanka at cricket on the television. Just at the final moment, the connection went down and we had to listen as the anchor staff from London told us of the final over victory. Tom set off for home and I set about fitting up my Skype for a call this afternoon. I also prepared all of the music for Arrochar for this Sunday and tried to prepare some music for Bill. Unfortunately one of the pieces had no sheet music, only an mp3 file and one can’t make a midi file from that. I searched and searched the internet for either the sheet music or for a midi file which I could adapt, but without success. David, still a bit under the weather, popped in to see me and is kindly coming back to complete some work on the Bothy tomorrow. At 3.30 p.m. I joined Green Pilgrimage colleagues from Denver (USA), Norway, Sweden, Canterbury, St. Albans, and Bath for a planning meeting. Isn’t technology wonderful? I taxed Rachel’s Bongo and then joined the family and Ann (who is here for the kilt-making tomorrow) for supper in the farmhouse. This was followed by a relaxing time in front of the stove – our house is very cosy – before walking Mix and retiring to bed. Rachel was in Berwick for her glass class today. She also arranged to get contact lenses – she thinks that they make her look older, I don’t think that at all. Other news: it is extremely cold! I continue to cough but am certainly over the worst. We are preparing to make Christingles for Church on Sunday. Tom set off to buy bits yesterday but forgot the licorice allsorts. Rachel set off to buy bits today and she also forgot the licorice allsorts. It will be my turn to forget them tomorrow!